Our most popular two-player game! One of man's oldest strategy games. Played by princes & peasants for 3,000 years, Morris is simple enough for children, yet the strategies can interest adults. The object is to form "mills"(3-in-a-row). When a you make a mill, you can steal an opponent's piece. You win by reducing the opponent to just 2 men. Early versions were played with 9 pieces, but in the 14th century diagonal lines were added to the board and was played with 12 men. Also called Merrils, or the Mill Game, Morris has been played in various forms, for 3,000 years. The oldest boards have been found in the temple of Kourna in Egypt, and an almost identical board was later illustrated in the 13th century in King Alphonso X's "Book of Games." 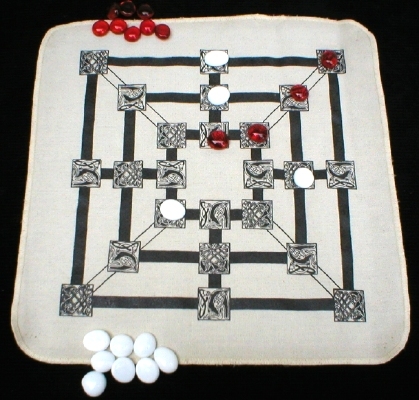 It has also been played with 9 men, and simpler versions have been played with 5, or 6 men on a board with just two concentric squares. During the 14th century diagonal lines were added to join the corners of the board and it was played with 12 men. This version was brought to the Americas by English settlers, but the 9-man version continues to be the most common. The Spanish king Alphonso X's 13th century Book of Games describes a version of 9-Man played with dice. During the first phase of the game, certain rolls gave the thrower the right to capture a piece, as well as adding a new man to the board.